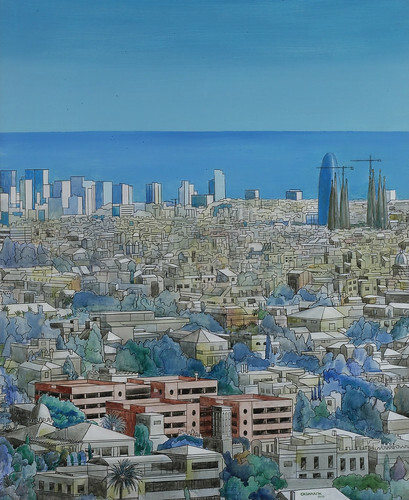 The UIC Barcelona Contemporary Art Collection was set up in 1997, at the same time as the university itself, as a visible manifestation of its profound humanist nature. The intense and extensive artistic tradition in the city of Barcelona creates a favourable environment to undertake a project of this type. The aim behind this project is to promote knowledge, awaken interest and develop awareness in relation to contemporary artistic creation. In short, to contribute to the cultural enrichment of the university community. For that reason, the artwork in the Collection is exhibited in various places around the university. The artwork the collection contains is chosen based on the criteria set out by a select group of gallery owners, art critics and cultural agents from the city who are members of the Collection’s Advisory Committee. At UIC Barcelona we are connected to the world. We encourage and believe in creativity.